Have you considered what you're going to do when you retire and no longer receive a regular paycheck? What are you going to do if you outlive your 401(k) retirement plan? Many retirees depend on payments from an annuity. An annuity is a contract you make with a life insurance company. In exchange for the premiums you pay the company for an insurance policy, you receive the benefits of tax-deferred growth and a steady income during retirement — no matter how long you live. You can choose to receive payments monthly, quarterly or in a lump sum. LIMRA, formerly known as the Life Insurance and Market Research Association, expects annuity sales to increase by up to four percent this year. It was a different picture last year. Annuity sales declined in 2017 after the Department of Labor partially implemented impartial conduct standards. The conduct standards required brokers and advisors to only recommend products that are in the best interest of investors, and to only charge reasonable compensation. Some brokers hesitated to recommend annuities because of uncertainty about the extensive new contractual requirements. The entire rule is scheduled to be implemented in July 2019. Still, annuities are popular with investors because, in addition to providing guaranteed income payments, there is no annual contribution limit. If you are nearing retirement, you can use an annuity to make "catch up" contributions to increase your savings account to the level it needs to be. Plus, the annuity compounds without your having to pay taxes during this period, which helps your retirement fund grow even faster. Annuities can provide either immediate or deferred income streams. An immediate annuity starts as soon as you pay the entire premium — either with a single payment or a series of payments. A deferred annuity provides a lower guaranteed income, but also gives you greater access to your investment. You can choose investments that work toward long-term growth or you can lock in a specific interest rate. Fixed — If you choose a fixed annuity, the insurance company will guarantee a certain interest rate for a fixed period. This option is popular with people who are more comfortable knowing exactly how much their money is earning. However, the downside is less growth opportunity for your investment. Fixed Indexed — With an indexed annuity, the insurance company offers a minimum rate of return, such as 1 to 3 percent. This helps preserve the principal and allows the funds to grow when the market is doing well. If the market has a good year, you receive a higher rate, but if it does poorly, you get at least the minimum rate. 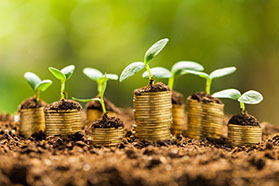 The annuity interest rate is determined in part by reference to an investment-based index, such as the S&P 500 Composite Stock Price Index, a collection of 500 stocks chosen to represent a broad segment of the market. Variable — A variable annuity gives you more control over your investment dollars. You can allocate your funds among a variety of stock options and choose whether to make those investments aggressively or conservatively. Variable annuities carry more risk, but have the benefit of possible higher returns — plus your investments are tax deferred. Variable annuities do not guarantee you will get a payout. Annuities are not for everyone. Some insurance companies charge high fees — two to three percent. Others impose high surrender charges if you withdraw your money before age 59 and a half. Surrender charges usually decline annually until they get to zero. You also must decide whether you feel the insurance company offering the annuities you’re interested in is financially sound, because you are depending on the company to support you throughout your retirement. Many investors feel the advantages outweigh the disadvantages. Talk to your broker or adviser if you think an annuity might be a valuable addition to your current retirement plan.